“Time is everything. Time controls everything. Time is destiny”, says Dr. Pillai. Each moment of time is infused with some energy configurations capable of influencing positive, negative or combination of results. 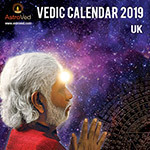 Our Vedic calendar 2019 is your reference guide to all the critical elements of time. Apart from listing the Moon phases, planetary transits and festivals, the calendar also informs you about the kind of activities that bring you benefits during a particular time depending upon the ruling planet. 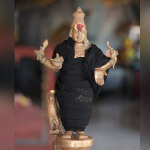 You will also find mention about Rahu kala, which is an inauspicious time of the day. Timing is fundamental in Vedic Astrology. The AstroVed Astrology Calendar for 2019 provides a simple and straightforward method for you to understand and use time in the most useful and meaningful way. AstroVed’s 2019 calendar is your year-long guide for all planetary transits, Moon phases, birth star days and more. With the help of this calendar, you can easily refer to critical elements of time and manage your day better.